Friday, April 19 and Monday, April 22, are weather days/student holidays for all Paris ISD campuses. 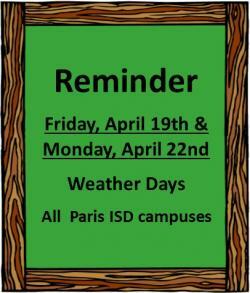 Paris ISD reminder: Friday, April 19 and Monday, April 22, are weather days/student holidays for all Paris ISD . . . 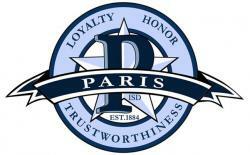 Please take a few minutes to fill out Paris ISD parent survey. Deadline to fill out survey is April 26th. English Link- https://www.surveymonkey.com/r/ParisParent2019 Spanish . 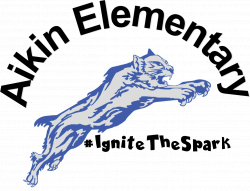 . .
For the second year in a row, a record number of Paris Independent School District students will participate in the Texas Future Problem Solving Program’s State Bowl. One hundred and three (103) . . . The Paris High School Varsity Winter Guard made school history by winning the silver medal at the North Texas Colorguard Association state championships at Flower Mound on March 30. This is the . . .
U.S. Army National Guard Corporal Jamie Roberts of Paris surprised his stepdaughter, Tansley, as a guest reader for story time today at Aikin Elementary School. After many hugs, Roberts finished . 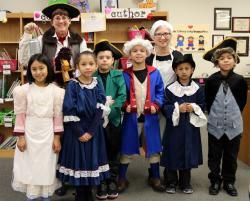 . .
Justiss Elementary School students recently taught their peers about American history. Socrates students, dressed in time period clothing, hosted the annual Colonial America Fair and talked to . . .
Paris High School seniors Asher Andoe and Easton Vaughn recently visited the pre-kindergarten classes at Givens Early Childhood Center. 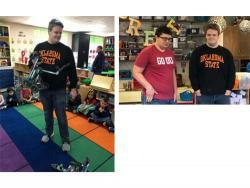 They talked to the young students about robotics, demonstrated . 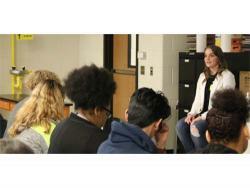 . .
Paris High School students in Health Science and Forensic Science classes recently learned about careers in nursing and sexual assault forensic medical exams from Morgan White, RN. White is a 2010 . . . The Paris Independent School District Police Department conducted a mock lockdown drill on Friday at Lamar County Head Start as a training exercise in emergency and crisis procedures. PISD Chief . . .
Paris ISD principals named employees for the February GROWL Award “Getting Results from Outstanding Wildcat Leaders” Customer Service Award - “I - Integrity.” Winners are Tamara Rollerson at Head . . .